Successful event branding involves more than just slapping your company logo onto a few decorations. It’s about creating a unique experience for the attendees, one that keeps them engaged while also consistently reminding them of your brand. This may be a challenge if you’re on a tight budget. But there are several easy solutions that let you brand your conference, gala dinner, launch party or other event without breaking the bank. 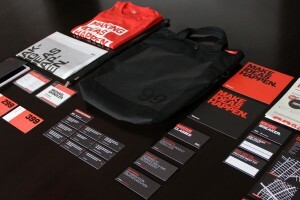 Here are some simple ideas for branding an event. This simple but creative invitation for a Starbucks sample tasting even includes a couple of free forks. Here’s an opportunity to introduce people to your event brand before they even actually attend. Invitations can be used to intrigue people and get them excited about your event. Including a logo and design that complements your branding strategy gives recipients a taste of what they can expect. Invitations can be professionally designed at a fairly low cost. If your guest list is relatively small and you’re willing to invest time rather than money, you could try creating hand-written invitations. This is a deeply personal touch that makes for intimate, down-to-earth event branding. Particularly sentimental patrons might hold on to your invitation as a souvenir, especially if it has a cool design. This provides your patrons with a lasting reminder of your branded event. Depending on the event you have planned and whether it’s a private or public affair, you might want to advertise using signage or handouts. Print marketing collateral is an inexpensive and easy way to get the word out. You can cheaply distribute it through direct mail or even wild posting. Be creative with your flyers, banners or posters and find some way to tie their design into your event’s overall theme. Keeping your branding consistent gives your event a sense of legitimacy and makes it truly memorable. Live-tweeting your event can help to engage people, even those who don’t show up in person. Here’s one way to promote and brand an event without spending a dime. As more and more of the business world moves online, sites like Facebook, Twitter and Youtube can be an invaluable part of your marketing plan. Inviting people to your event via Facebook is quite common, but it doesn’t have to stop there. Consider using social media before, during, and after your event. You can build anticipation and buzz, live-tweet with up-to-minute details, and post photos or videos the day after. Just make sure that your online presence is written in the same voice as the rest of your brand marketing. Whether you’re serving a full meal or just hors d’oeuvres, food and beverages are a vital factor in your event branding plan. Serve refreshments that complement your event’s brand, theme and color scheme. For example, if the color red is a recurring element in your marketing material, you might want to serve red-colored cocktails. You could even make a baked dessert with icing in the shape of your company logo. Making your refreshments match your brand shouldn’t cost much, but it makes a big impression on guests. A champagne flute branded with your company or event’s logo makes for a tasteful accent. Printed cups and glasses come in a variety of interesting styles, and can easily be customized with a logo or design that matches your brand. Many drinkware items can be purchased for less than $0.50 per cup, making this one of the more cost-effective ways to brand an event. Consider using drinkware that matches the overall tone of your event. For example, stadium cups would be appropriate for a picnic or casual lunch, while an elegant gala might benefit more from classic champagne flutes. If you’re serving food at your event, personalized napkins, plates and utensils are subtle and inexpensive ideas for keeping your brand in the spotlight. Custom tableware lets you associate your company logo with something positive: specifically, a tasty meal. It’s almost like a Pavlov’s dog response; juxtaposing your brand with a benefit (food, in this case) can help to generate interest and goodwill in your guests. Certain events (such as conferences or conventions) might benefit from branded clothing such as T-shirts or hats. Personalized apparel items are relatively inexpensive, and they can serve as mementos for your event. Try using custom apparel as giveaway prizes, party favors or merchandise. With attractive graphic design, wearable marketing collateral can give your brand exposure even after the event is over. Sometimes the major attraction of a branded event is a lecture or speech from a qualified speaker. If your planned occasion is a fundraiser or educational experience, a speaker can provide your guests with valuable information. Hiring a professional lecturer can be expensive, but some individuals are willing to speak at an event at little or no cost (especially if it’s for a good cause). With a little hunting, you may find a low- or non-paid speaker who fits seamlessly with your brand. Rather than oversaturating the audience with their logo, the Academy Awards is all about creating a distinctive environment. Often, good event branding is all about looking at the big picture instead of just the individual elements. Your venue, decor and event attractions should all be part of a single, cohesive environment. For example, look at a famous event like the Academy Awards. Sure, the occasion does have a “logo” of sorts (the golden “Oscar,” which might actually be more of a mascot), but there’s much more to it than that. The entire event is less about overloading people with a logo and more about maintaining a consistent atmosphere. The red carpet, the clothes, the lavish presentation; everything about the Oscars is both instantly recognizable and integral to its overall look and feel. You definitely don’t need a budget as big as the Oscars, but your event shouldn’t seem like just another day in your guests’ normal everyday life. Try choosing a venue and creating an environment for your guests that immediately makes them aware that they’re entering a different world. Give your guests something to remember your event by. Gift bags, promotional products or other takeaways help to cement good memories of your event in the minds of your guests. Keep your takeaway gifts relevant to your event branding and business plan. For example, a launch party for a beauty care provider might provide free samples of skin cream or conditioner. These are just a few ideas that allow you to brand an event inexpensively. If done effectively, event branding lets you boost awareness about your product, cause or company throughout the entire occasion and beyond. P.O. Box 27859 00100, Nairobi, Kenya.